Commerce City – with Pinkard Construction and Perkins + Will – recently celebrated the grand opening of the new Bison Ridge Recreation Center. 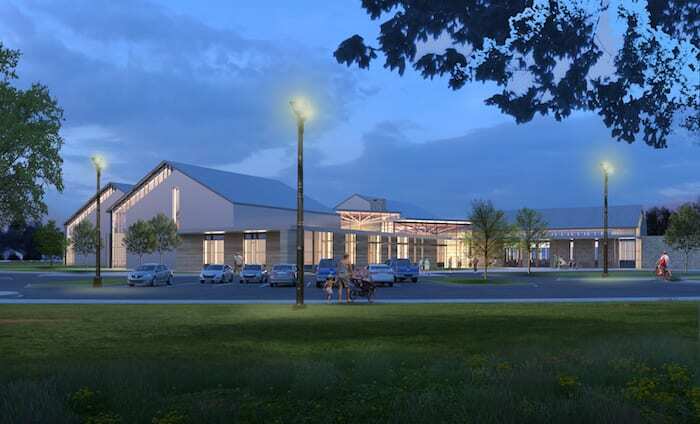 The fourth project in the city’s voter-approved capital improvement program, Bison Ridge Recreation Center is a 108,000-square-foot facility at 13905 E. 112th Ave. It includes an indoor pool, multicourt gymnasium with an elevated walking/ jogging track, a nearly 10,000-sf gymnastics area, weights/fitness area, dance/aerobics studio, rooftop fitness deck, a 300-person community room and the largest collection of public art sculptures in the city. Materials were selected to balance an industrial character with the traditional typology, cladding the larger forms in deep patina metal cladding and rustic lap-board siding, rugged Colorado buff sandstone and ample glass to highlight its function as a vital center of community activity, according to Kastelic. Inside the building, the same character of materials leads patrons through the public spaces with clear views into activity areas. While the recreation center’s original scope and budget grew by nearly 40 percent, the targeted spring opening date did not change. Pinkard Construction worked in a strong teaming relationship with the owner/architect team to find creative ways to fit the growing scope into an unbending schedule. This collaboration allowed for a timely start and an efficient construction phase, culminating with the on-time grand opening. Published in the July 2018 Development, Construction & Design section of CREJ. Bison Ridge Recreation CenterCommerce CityConstruction Design & EngineeringPerkins + WillPinkard Construction Co.